Get some cultural insight at Tusayan Museum and Grand Canyon Railway Depot. On the 12th (Sat), hike the day away at Bright Angel Trail. Next up on the itinerary: hike along Rim Trail, take some stellar pictures from Grandview Point, examine the collection at Kolb Studio, and don't miss a visit to Grand Canyon Village. For maps, reviews, photos, and more tourist information, you can read our Grand Canyon National Park road trip planning website . Sao Paulo, Brazil to Grand Canyon National Park is an approximately 22.5-hour combination of flight and bus. You can also do a combination of bus and flight. The time zone difference moving from Brasilia Time to Mountain Standard Time is minus 4 hours. Plan for little chillier nights when traveling from Sao Paulo in September since evenings lows in Grand Canyon National Park dip to 7°C. Wrap up your sightseeing on the 13th (Sun) to allow time to travel to Las Vegas. Give yourself a bit of retail therapy at The Strip and The Grand Canal Shoppes at The Venetian. The Mob Museum and The Neon Museum are good opportunities to explore the local culture. Step out of Las Vegas with an excursion to Henderson Bird Viewing Preserve in Henderson--about 32 minutes away. Spend the 17th (Thu) riding across the waves with a waterskiing or jet-skiing adventure. Next up on the itinerary: look for all kinds of wild species at Lake Mead National Recreation Area, explore the wealth of natural beauty at Red Rock Canyon National Conservation Area, enjoy breathtaking views from Eiffel Tower Viewing Deck, and try your luck at Wynn Las Vegas. To see reviews, where to stay, ratings, and tourist information, go to the Las Vegas tour itinerary maker website . You can do a combination of flight and car from Grand Canyon National Park to Las Vegas in 4.5 hours. Alternatively, you can drive; or take a shuttle. 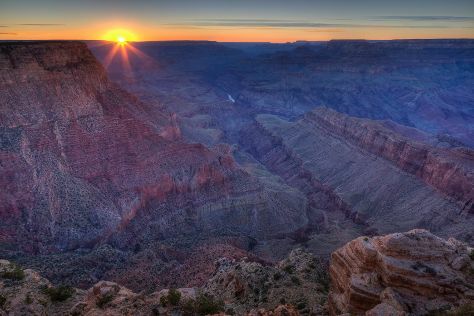 Traveling from Grand Canyon National Park to Las Vegas, you'll gain 1 hour due to the time zone difference. When traveling from Grand Canyon National Park in September, plan for somewhat warmer days in Las Vegas, with highs around 39°C, while nights are much warmer with lows around 25°C. Wrap up your sightseeing on the 17th (Thu) to allow time to travel to San Francisco. Alcatraz Island and Fisherman's Wharf are good opportunities to explore the local culture. Relax by the water at Marshall’s Beach and Fort Funston National Park. Explore the numerous day-trip ideas around San Francisco: Armstrong Redwood State Reserve (in Guerneville) and Dolphin & Whale Watching (in Moss Landing). And it doesn't end there: stroll through China Beach, contemplate the long history of SS Jeremiah O'Brien, take a stroll through North Beach, and look for all kinds of wild species at Don Edwards San Francisco Bay Wildlife Refuge. For photos, reviews, traveler tips, and more tourist information, go to the San Francisco trip planning app . You can fly from Las Vegas to San Francisco in 4 hours. Alternatively, you can drive. Prepare for slightly colder weather when traveling from Las Vegas in September: high temperatures in San Francisco hover around 28°C and lows are around 17°C. Finish your sightseeing early on the 23rd (Wed) to allow enough time to travel to Los Angeles. The Getty Center and Santa Monica Pier are good opportunities to explore the local culture. You'll get in some beach time at Venice Beach and Boardwalk and Nicholas Canyon Beach. Venture out of the city with trips to Manhattan Beach (in Manhattan Beach), Zuma Beach (in Malibu) and Santa Monica Mountains (in Santa Monica). Next up on the itinerary: enjoy the sand and surf at Will Rogers State Beach, look for all kinds of wild species at Kenneth Hahn State Recreation Area, tour the pleasant surroundings at Santa Monica Bay, and admire the majestic nature at Santa Monica State Beach. To see traveler tips, photos, ratings, and other tourist information, use the Los Angeles route planning tool . Traveling by flight from San Francisco to Los Angeles takes 4 hours. Alternatively, you can do a combination of train and flight; or drive. Traveling from San Francisco in September, expect Los Angeles to be somewhat warmer, temps between 34°C and 22°C. Finish your sightseeing early on the 29th (Tue) so you can travel back home.